Christmas shopping here is very different somehow … far more relaxed. Of course we can (and do) order things on Amazon but we really try not to – much preferring to buy from our local shops and take advantage of some of the local craftspeople who make really lovely things that are great for presents. http://www.orkneytweed.co.uk/ – I confess to a shopping accident with them as I bought one of their lovely rugs for the “little” sitting room … though at the moment it is in our main living room because I have had a cold and felt sorry for myself so wrapped it over my legs and watched TV one afternoon ! The cats, needless to say were delighted to take advantage of it ! http://www.thelongship.co.uk/ … we daren’t go in here too often at any time of the year as we keep finding things we love (see the picture of the phone – yes it’s a trim phone and nearly makes the right noise but don’t you adore the colour ?). So if you phone you can visualise me on that vivid green stool as I chat to you ! 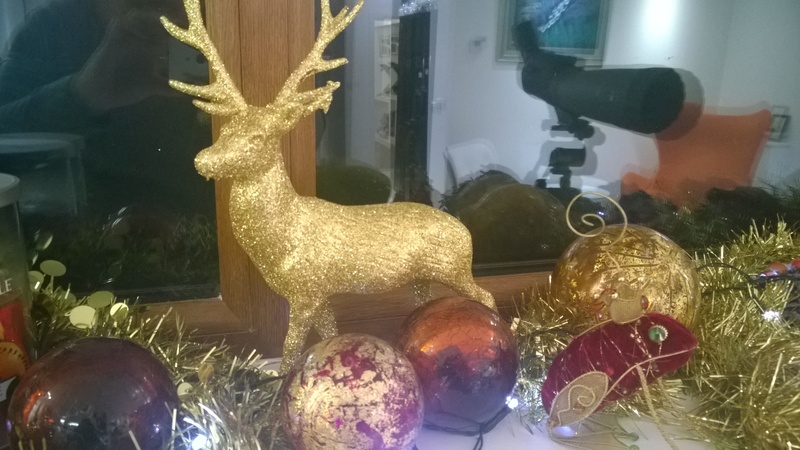 And the gold stag came from there too ! We started our Christmas shopping quite early – for us anyway – because all our gifts have to be posted south to the family. It was great – very relaxed and a far cry from places like Lakeside. It was somehow very uncommercial which sounds like a contradiction in terms, but we felt we were really able to think about what we were buying and have hopefully managed to end up with presents that people will enjoy. We do hampers for “the children” each year with various small goodies, and William Shearers is just perfect for this, with delightful yumminesses to tempt us to buy – and we generally end up with rather a lot of goodies for ourselves as well of course ! It’s the most amazing shop – the grocery section has most of the things that people living in England think we can’t actually get on Orkney, they do a wonderful Christmas display and a Santa’s grotto for the children. Plus masses of household stuff, nuts, bolts, hangers, brooms, buckets and so forth. An agricultural section with seeds and animal feed, bird food, and seasonal things like seed potatoes, an impressive gun shop, fishing tackle, and at this time of year, Christmas trees. Far too much money was spent but hey – it was worth it !!! That’s where our splendid twice decorated tree came from as did the goodies in our goody bowl. 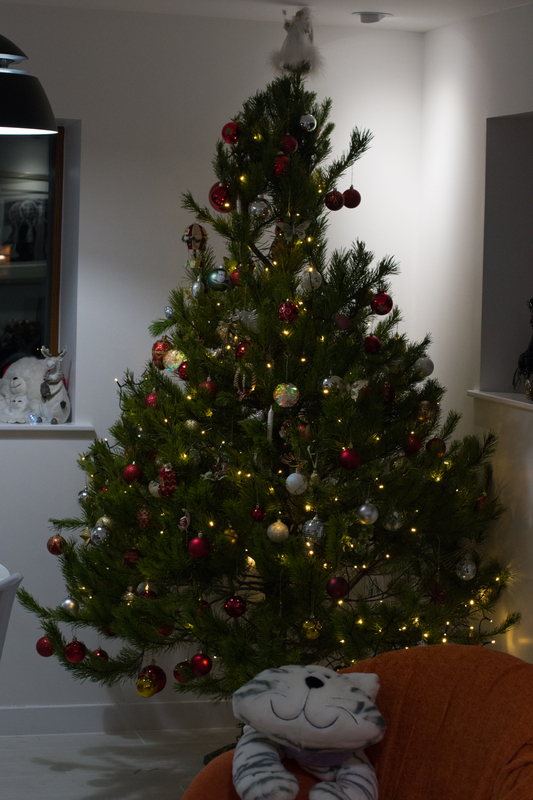 The tree was twice decorated because – we did it all beautifully then relaxed and enjoyed our handiwork at which point it slowly toppled to the floor smashing rather a lot of baubles and dislodging even more. 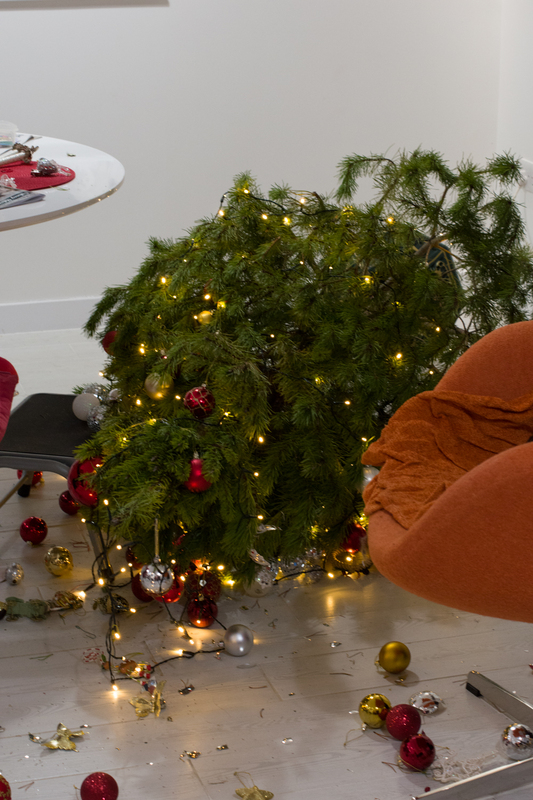 Poor Nimbus was looking on in horror from his chair, wondering if we were going to blame him ! However, neither he nor Phercad were to blame this time; the screws that hold it in place in the stand had bitten too far into the tree itself and it has just collapsed. So amid a certain amount of colourful language, Mark got it upright again, fixed it (very) securely in place and we started decorating it all over again ! But it does look lovely now. We both recalled the time Mark ordered a tree and it was so big we couldn’t get it into the hall at the Station … the picture of that is part of our Christmas decorations and I suspect this one will join it as a salutary reminder of what happens when you don’t fix it properly. 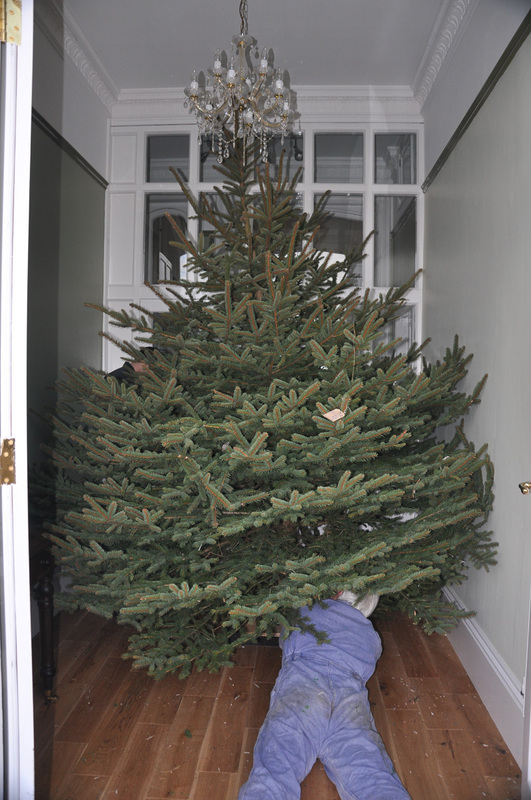 That is the last time I let the shop choose a christmas tree!